The first talk I attended at this year’s JMM in Seattle was Tim Gowers’s lecture on how the internet and mass communication might change mathematics. Tim started out by listing some of the more dysfunctional features of how we do mathematics today, then suggesting how they might be improved. I very much agree with that part, and I would like to mention a few points from it here. Our basic and most important unit of discourse is a research article. This is a fairly large unit: effectively, we are required to have a new, interesting and significant research result before we are allowed to contribute anything at all. Any smaller contributions must be bundled and packaged into units of acceptable size, or else they go unacknowledged. A comparison that came to my mind was having to conduct all transactions in twenty-dollar bills. Whatever your product is, you would have to sell it for $20 or else give it away for free, with nothing in between. It should not be difficult to see why this would not be am ideal environment for doing business. We should have smaller bills in circulation. It should be possible to make smaller contributions–on a scale of, say, a substantive blog comment–and still have them count towards our professional standing. Our culture is extremely competitive. We value beating others more than we value helping them. All that matters is getting “there” first and scooping everyone else on our way. Intermediate results are worth far less. Additionally, this prioritizes one specific type of contributions over all others, even in those cases where a different order of priorities might be more reasonable. A good expository paper might have more impact on its area of mathematics than a middling research article; and yet, expository work is rarely, if ever, taken seriously by funding agencies and tenure committees. We spend a great amount of time and energy on reinventing the wheel. A mathematician working on a problem might start with relatively small reductions, observations and lemmas that, by themselves, do not qualify as journal-publishable units; if that effort is not successful, these smaller contributions are lost and the next person working on the same problem has to reprove them all over again. Moreover, information such as “this method didn’t work, and here’s why” might be very useful to that next person. If nothing else, a great deal of time might be saved that would otherwise be spent on trying out unsuccessful approaches. Yet, there is currently no system in place to circulate such information and reward those who provide it. I agree with all of this, and I’d love to see us abandon the old ways and adapt new ones. We are far too invested in forcing everyone to fit the same mould. In a profession we like to call creative, I’d love to see more diverse and varied career paths and modes of expression. I’d love to see the flow of information a little bit less hampered by our ambition and competitive instincts. Think of all the theorems we could prove if we allowed more people into the field and, instead of hampering their intellectual power, harnessed it to the full. I do not believe, however, that such changes are inevitable, and I have very little faith that they will be forced by the internet and other means of mass communication. It takes more than technology to change the culture. The early evidence is not encouraging. The basic discourse unit is still the research paper, except that we now post these on the arXiv. Other types of research contributions are still not being counted towards career progress, even as the subject comes up in discussions over and over again. We are as competitive and territorial as ever. The Polymath projects came and went; one was successful, another one was somewhat productive, others fizzled out. They did attract more participants than conventional math collaborations, but they never became truly “massive” as originally envisioned. People still ask questions on Math Overflow, and sometimes they get useful answers, but it never became the universal communication and collaboration platform that some of its early enthusiasts seemed to imagine. Other, smaller discussion boards went mostly unnoticed. There’s not much actual research that gets done on public blogs or social networks. At the end of the talk, someone raised the diversity point in a question. The participants in Polymaths, Math Overflow and other similar projects are even less diverse than the general population of research mathematicians. Is there a reason why women and minorities tend to stay away from such venues? What can mathematicians do to ensure that all of us feel welcome to participate? I do not feel that Tim really answered that. He said (and I hope that I’m summarizing it fairly) that all those changes are just going to happen, like it or not, because they bring a more efficient way of doing mathematics and nobody will want to give up on that. It is an unfortunate fact that some people feel less comfortable on the internet, but in the end we will all just have to get over it. I would like to suggest a different answer. This book has been in the works for some years now, and I’m thrilled to finally have a demo copy to show you. 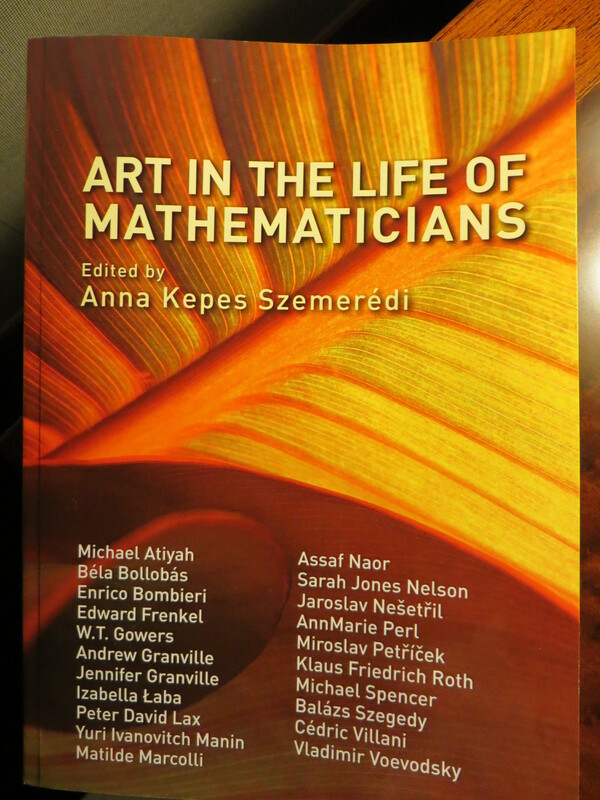 The book will be published by the American Mathematical Society. The demo copy has been produced (impressively quickly!) by the Hungarian publisher Ab Ovo. I’m very grateful to Anna Kepes Szemerédi for envisioning this project in the first place, and for all the hard work she has put into it. I have contributed an essay on photography. You can download it here, and here is the gallery of the photos I offered to be used in the book. The photo on the cover is also mine. I hope that this will encourage you to purchase the book when it becomes available; I’m only one out of many contributors (see the cover for the list of names), and the book format will add further value through graphic design. 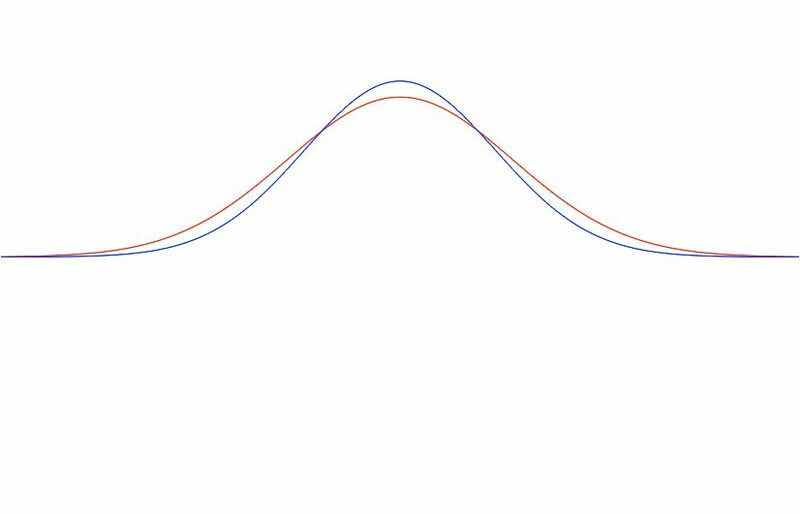 If you’re expecting “mathematical art” as exemplified for example by the Bridges conference, I must warn you that this is not what I do. (In the essay, I explain why.) There is some overlap with one of my blog posts from last year: the post was adapted from an earlier version of the essay, and then I used it in writing the final version. In contrast to the single-mindedness and commitment demanded of a chef d’ecole, we might set the image of the “lady painter” established by 19th century etiquette books and reinforced in the literature of the times. It is precisely the insistence upon a modest, proficient, self demeaning level of amateurism as a “suitable accomplishment” for the well brought up young woman, who naturally would want to direct her major attention to the welfare of others–family and husband–that militated, and still militates, against any real accomplishment on the part of women. It is this emphasis which transforms serious commitment to frivolous self-indulgence, busy work, or occupational therapy, and today, more than ever, in suburban bastions of the feminine mystique, tends to distort the whole notion of what art is and what kind of social role it plays. This got me thinking back on what I wrote about photography and wondering for a moment if I might have fallen into the trap of “suitable accomplishment.” In the end, it clarified for me the distinction between the commitment to the process of getting better, and the expectation of achieving a certain level of excellence, and the expectation of gaining public acclaim. I have always been anything but unambitious. Nonetheless, I have never aimed to be a “great artist.” I am not altogether indifferent to success in art, as evidenced by this self-promotional post, but what made me pick up the camera is the pleasure I find in taking photographs. My enjoyment of it is not conditional on finding an audience, receiving public recognition, or on any presumption of greatness. Instead, it comes from trying to get better at it. The pleasure is not in taking the same photographs over and over again, but in expanding my range, improving my technique, seeking out new ideas and solutions. The seriousness of my commitment is in my engagement in the process. I suppose that this does not make me a lady. Would a mathematician pass the Turing test? You’ve probably seen the recent announcement that a computer passed the Turing test for the first time. The announcement was followed by a healthy round of skepticism and mockery, with transcripts of chats with “Eugene” posted on a number of websites. Among other things, it has been pointed out that introducing “Eugene” as a 13-year-old Ukrainian boy holding a conversation in English would dupe most people into giving him much more slack with regard to awkward language and deficient social graces than they might otherwise. Well, why Ukrainian boys and not mathematicians? I didn’t get to chat with Eugene. However, here is a conversation that I might or might not have had with an internet user that we’ll call Boris. I’ll let you decide. IL: Hi Boris. I’m Izabella Laba and I work at UBC. BORIS: Hi Izabella, it’s nice to meet you. I’m Boris. So what classes do you teach this semester? IL: Actually, it’s summer and I don’t teach. BORIS: That’s very interesting. So how many students do you have? IL: I’ve just told you I don’t teach in the summer. But tell me about your research. BORIS: As you probably know, I work on modulated gvoorups on questable aussifolds. I have proved that if a modulated gvoorup has a subquestable chain of hyperchenettes, then the aussifold must be oubliettable. This links several areas of mathematics and should have implications for the rapidly developing field of quasialgebraic oubliettability. You can read my papers to learn more about this interesting and exciting area of research. IL: That sounds fascinating. What is a gvoorup? BORIS: You can read my papers to learn more about it. IL: … OK. But can you tell me why you are interested in gvoorups? BORIS: It is a very interesting and exciting area of research. So what do you work on? IL: Well, harmonic analysis on fractal sets. BORIS: It is a very difficult area of research in which it is very difficult to have any new ideas. IL: How do you know that? BORIS: This is well known to everyone in the field, even if it has never been published. So who do you work with? IL: Uhm, I’ve been a full professor for some time now. Are you assuming that I’m a junior researcher because I’m a woman? BORIS: Women are more interested in teaching than in research. If you’re looking for more women, you should go to a teaching related forum. IL: I’m pretty sure I’m more interested in research than in teaching. BORIS: That’s great. So what classes do you teach this semester? IL: You’re repeating yourself. I’ve answered this already. BORIS: That’s very interesting. Have you seen my paper on gvoorups from 1995? It may be relevant to your work. IL: Honestly, I doubt it. BORIS: It’s been nice meeting you. Please let me know if you have any questions about my paper. Comments Off on Would a mathematician pass the Turing test? A few weeks ago, I finally got around to reading “Between the Lord and the Priest”, a book-length conversation between Adam Michnik, Jozef Tischner and Jacek Zakowski. I came for the historical content, but stayed in part for certain disputes in Catholic theology in Poland in the 1960s and 70s. It’s not my usual cup of tea; Tischner himself acknowledges that all this was of very limited interest to the general public while trailing well behind contemporary Western European philosophy. It nonetheless describes beautifully some of the disagreements I’ve had with my fellow mathematicians with regard to life in general and social issues in particular. The framework for the dispute is provided by the long-standing dichotomy between St. Augustine and St. Thomas Aquinas. The way Tischner explains it, Thomism posits eternal, unchangeable truths that must be accepted as dogma and followed in life. It prescribes synthesis, universality, vast generalizations, logical chains of cause and effect all the way back to deity. Augustine, on the other hand, is less sure of himself. Even if the truth, somewhere out there, might be eternal and unchanging, our understanding of it is grounded in history, tradition and experience, and in the end that understanding is all we can ever access. In practice, this is a more bottom-up approach to religion, starting with personal, individual existential questions and then seeking guidance in the Scriptures and the church’s intellectual tradition. Now, here is where things get interesting. Tischner goes on to say that Thomism, in its methodology and spirit, is actually quite similar to Marxism. Marxists, too, had their axioms of class struggle and dialectical materialism. They presumed to shape human consciousness through class awareness, much as Thomists presumed to shape it through philosophical and religious dogma, with little regard to individual experience and understanding. That was why Michnik, an atheist and a leftist at odds with communism, tuned into Tischner’s polemics with Thomists. Thomism, like Marxism, represented codified, linear thinking where “one thing always follows from another, and everything is perfectly arranged and therefore very simple.” Tischner found that he could not talk like that to his parishioners – people who’d fought in the war, lived through the horrors of Nazi occupation, made choices that most of us wouldn’t want to think about. Their experience defied the scheme. Michnik, then in his twenties and already a veteran of protests and prisons, trying to graduate from university before his next arrest, had no love for simple explanations of everything, either. He’d rejected Marxism already; he would go on to consider religion, but not if it offered no escape from the same kind of closed-minded thinking, not if it were perfectly arranged with one thing always following from another. knowledge consists of approximately faithful “reflections” of that world in consciousness. The second part of that, understood literally as Lenin indeed intended, is, on a very basic level, at odds with science, and I could say much more along these lines just based on my experience with photography. What’s less funny is the underlying Thomist assumption that there can only be one intellectually correct interpretation and only one right set of conclusions, namely those espoused by the bearer of the dogma, and that any departure from that must be a result of either misinformation or bad faith. When communists censored dissenting opinions, part of it was a genuine conviction that such opinions were obviously nonsensical and therefore there was no reason to disseminate them. When they lost the 1946 referendum in Poland, they blamed it on “confused thinking” and “complete ignorance” among the population. In a similar vein, but centuries earlier, the Catholic Inquisition might first try intellectual arguments, but if the accused were not persuaded, that constituted proof that they were possessed by the devil, because how else could they not agree? Thomists responding to Tischner informed him on a regular basis that he did not really know St. Thomas, because had he known him, he’d love him. I started drawing my own analogies long before the point where Tischner actually uses the word “mathematical.” Like a good Augustinian, I’ll start with specifics. A couple of weeks ago, in a comment section far away, a mathematician proposed to “solve racism” by generalizing it (to something he never quite defined) so that racism itself would follow easily as a special case. In a different comment section last year, several mathematicians insisted on a purely mechanistic solution to sexism in mathematics. They accepted it as a self-evident axiom that mathematicians were progressive and well-intentioned people who would automatically eliminate sexism from their ranks if it only were pointed out to them. One might of course wonder why it hasn’t worked yet; but one would then be doubting an axiom, an act that’s not only morally reprehensible but, worse, logically inexplicable. I’m thinking of mathematicians who’ve argued with my blog posts by taking shots at some sentence pulled out of context, the way they might point to an incorrect formula in a math paper. I’m thinking of one person who started a discussion with me, then allowed reluctantly in response to my arguments that he might not be able to change my mind after all, because convincing people is hard in general. Apparently, the possibility of me convincing him had never been on the table. I’m thinking of those who expected I’d stop believing in that gender bias thing if they only could explain it all to me, almost like religious evangelists. Sorry, no. I’ve heard your arguments many times already. I disagree with them, not because I don’t understand them well enough, but because I do. They don’t address my experience, and they never will if you keep starting from your own axioms instead. It became clear to me over the last couple of years that I’m not, and probably never have been, part of a “mathematical community” of any kind. Sure, some of my best friends are mathematicians. I do my expected share of “service to the community.” But after hours, I’d rather kick off my shoes with people who at least share my logic. I’d rather discuss experiences, not axioms. I’d rather debate someone who’s actually listening to me, not just building his own castles of abstraction. It’s been claimed by some of those in question that mathematics itself supports Thomist thinking. (As in, “I’m a mathematician and therefore this is how I approach this problem.”) I’m not so clear on that. To some extent, sure: we’re all trained in binary logic and deductive reasoning, as we should be. But in my own research practice, I often work in the Augustinian direction, starting with specific examples and then working towards something more general. Freeman Dyson’s “Birds and Frogs” article comes to mind, except that I’ve met froggy types like me who are incredibly dogmatic on social issues, and birds who are not. If I were a Thomist, I’d try for a diagnosis, conclusion, and a list of recommendations for my peers. Maybe the problem is when mathematicians Act Like Mathematicians, showing off their smarts where wisdom is called for. Maybe, too, it’s unexamined purchase into the letter of the deductive philosophy of Russell and Bourbaki, without stopping to consider the actual practice of mathematical research; but that argument becomes circular right there. So, instead, I’d rather just leave you with something to think about, and excuse myself from Math Overflow once again.